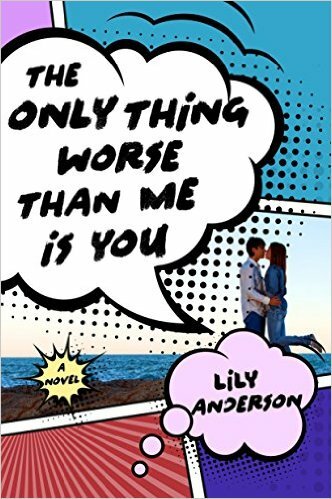 #Bookreview by Olga Núñez Miret (@OlgaNM7) The Only Thing Worse Than Me Is You. Much Ado About Nothing’ for YA in a school for gifted kids. A quick-fire delight. Trixie Watson has two very important goals for senior year: to finally save enough to buy the set of Doctor Who figurines at the local comic books store, and to place third in her class and knock Ben West–and his horrendous new mustache that he spent all summer growing—down to number four. Much Ado About Nothing’ for YA in a school for gifted kids. A quick-fire delight. Thanks to Net Galley and to St. Martin’s Griffin for providing me a free ARC copy of this book in exchange for an unbiased review. When I read this book was a modern take of Shakespeare’s Much Ado About Nothing for young adults I could not resist. It’s one of my favourite Shakespeare’s comedies and it’s had pretty good adaptations to screen. I am very partial to Ten Things I Hate About You and I hoped this would be as good if not better. Told in the first person, this novel’s narrator is Trixie (Beatrix, of course), who is a fiercely intelligent and feisty shrew. She’s a geek, loves comic books, TV series (Dr Who among them), and attends a school for gifted youngsters, that is a fascinating ecosystem, with its own rules, its fights for top position and ranking, and it’s aristocracy (all based on merit, intelligence and hard work). Her two friends, Harper and Meg, are also very clever but very different to her in their unique ways (Harper, who is kind to a fault, lost her mother years back and her family life is fairly empty despite the money, and Meg’s psychologist parents seem to track any behaviours that might fit in some theory or other, and she is always trying to classify friends and actions around her as if they took place in a lab). Of course, there would be no school without boys, and Trixie has a long-term enmity with Benedict (Ben), who shares many of her hobbies and dislikes but who can’t open his mouth without aggravating her. Everybody but the two people involved know the pair are a perfect match, but making them see it proves a hard task. Students start getting suspended and they don’t realise at first that behind exams, essays, tests, balls and functions, there is somebody messing up with pupils’ results with dramatic consequences. The characters are as clever as is to be expected from the school they attend, and at their age, they know everything. Their references to both pop culture and Culture with capital letters are flawless, witty and make for a great read. The dialogue is fast, clever, and funny (I must confess to laughing out loud quite a few times), and appropriate to the age of the characters. Although they are clever, they are also young, naïve, and at times very innocent and that makes them plausible teenagers. They are friends of their friends, they confront serious moral issues (for their age) and they are articulate, wholesome but sometimes mean. I remember talking about a young adult book to a reader who told me he couldn’t remember having met girls as clever as the ones in the book. Well, I did, and although perhaps the interests might vary depending on the person and the era of our school years, I appreciate a young adult book where the young protagonists are clever, study, and care for each other. And are very funny too. I thoroughly recommend this book to anybody who likes high-school young adult novels (I have no doubts adults will like it too), and I’m sure people who enjoy Shakespeare and pop culture references will have a field day. And I look forward to more books by the writer. What the book is about: High school, studies, friendships, young love and a wonderful Shakespeare adaption for young adults. Book Highlights: The geeky and pop culture references, the wit of the characters, a book about young people where they actually study, and wonderful and clever dialogue. Challenges of the book: I think not many readers will get all the references, either high-brow or pop cultural ones, but I don’t think that will diminish the enjoyment of the story. What do you get from it: A fun version of a Shakespeare comedy, where young people are intelligent, funny and friends of their friends. Who Would I recommend this book to? : I don’t think it’s necessary to be a fan of YA books to enjoy this novel. If you like the film ‘Ten Things I Hate About You’, I’d definitely recommend it. It made me laugh out loud and I can’t say that of many books. Wow, this sounds intersting. Thanks for the recommendation!